In Beethoven’s ‘Appassionata,’ darkness overwhelms light. In 1804, following works born of the idealism of the French Revolution and the Enlightenment such as his “Eroica” Symphony, Beethoven created the greatest musical explosion for solo piano of its time: the Sonata No. 23 in F Minor, known as the “Appassionata.” It is a work of a very different temper. The main expectation of the Viennese Classical sonata was to provide the listener with a well-balanced mix of delight and surprise. Mozart was particularly skillful in the former, while Haydn excelled at the latter. Beethoven’s recipe was to write an emotionally involving composition that would hold the listener’s full attention until the very end, one in which shifts and surprises were part of a dramatic entirety. Among Beethoven’s 32 sonatas, the “Appassionata” stands out for its uncompromising pianistic drive and extremely effective dramaturgy. One early 20th-century commentator spoke of the work’s “rush deathward.” The absence of any hint of a silver lining in the work was well ahead of its time. Over the course of its three movements, the “Appassionata” pulls the listener through a wide range of extreme emotions. The drama begins with the pianist slowly reaching to the keyboard. Unison notes then fall downward and stalk upward, giving rise to a mysterious stillness. Suddenly the music bursts its bounds, and as it charges ahead the pace relaxes into a lyrical and hymn-like episode of graceful beauty. The dream soon proves to be a nightmare, though, as the fierce turbulence that lurked behind the work’s quiet opening regains its full potential. More dramatic shifts follow as episodes of extreme velocity, furiously jolting rhythms (that could be described as jazzy had they been created a hundred years later), and moments of solace alternate in transporting the listener. But is the source of the diabolic power of the “Appassionata” simply the drama of violent surprises and shifts of mood? 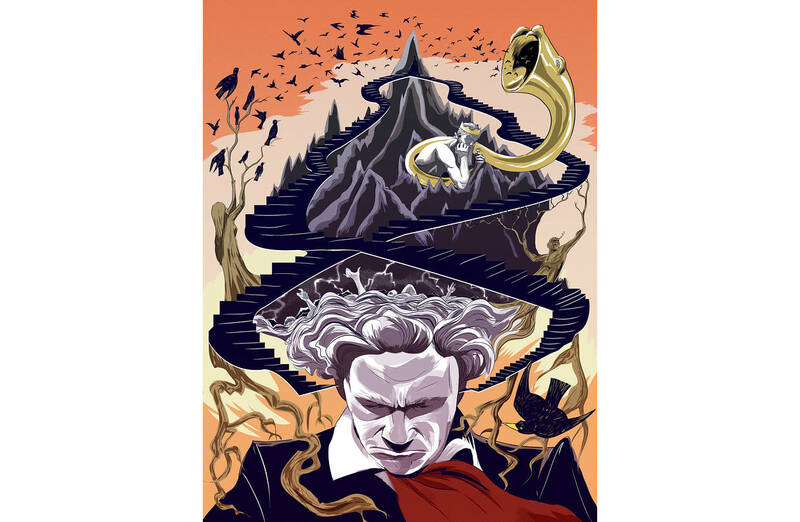 In my view it stems from something deeper, the way Beethoven highlights the tension between what was by then Western music’s most fundamental building blocks, the major and minor keys. You know what these are even if you think you don’t. Music in a major key usually sounds optimistic, cheerful; music in a minor key often sounds sad, even foreboding. These traits—naturally elaborated and complicated beyond what words can describe—add much to the music’s meaning and provide a kind of a dramatic framework. In Beethoven’s day, “public” works such as symphonies needed to end upbeat and in a major key; it simply wouldn’t do to send a large audience home with an unpleasant aftertaste. However, in pieces written for smaller, private audiences, such as piano sonatas, Beethoven was emboldened to continue in the darker mode until the very end. In the “Appassionata” he made use of this freedom as he did nowhere else. Throughout the sonata we are witness to a back-and-forth drama of major conquered by minor, or, if you will, darkness overwhelming light. Much of the piece’s harmonic structure includes the systematic repression of brighter themes in major keys. The first movement’s lyrical second theme (in A-flat major) is the first victim. The propitious melody comes to a sudden standstill; a strident chord interrupts and the music veers off into minor. Throughout the rest of the movement, other major keys become strangled by minor. This impulse reaches its climax in the cataclysmic second part of the sonata, which comprises the second and third movements, which follow each other without a break. Remaining entirely in major, the second movement denies the horrors of the first movement until the sudden and terrific opening gesture of the minor key finale crushes the hopes represented by the major once and for all. The major mode makes one last attempt at an entrance near the very end of the work, but tragically late. And because of its tardiness it sounds like devil’s laughter in the face of ultimate damnation. Czerny speculated about the finale that, “Perhaps Beethoven, ever fond of representing natural scenes, imagined the waves of the sea in a stormy night, whilst cries of distress are heard from afar.” Audiences over the past two centuries have perceived them to be devastatingly close. The modern listener may be inclined to either view, while every performance cultivates a truth of its own. In the end, what remains certain is that the “Appassionata” is a masterpiece that remains eternally fascinating with its eerie, brilliant and original wildness. —Mr. Jumppanen, a Finnish pianist, will perform the “Appassionata” along with other works at the Frick Collection on Oct. 8.